Textile Treasury: Lino prints and feeling felty. Lino prints and feeling felty. Tapping away at my lap-top in rhythm to the pattering of the rain on the conservatory roof. Actually, I have a sneaking feeling of comfort and cosyness, despite the awful weather; I don't have to go out again today, Jim's away so no big meal to cook, chores done this morning so rest of the day to myself. Off to Norwich with friend Sue K tomorrow- we have booked lunch at Jamie Oliver's new (ish) restaurant, and we will be having a wander round the shops, no doubt. Then on to my melodeon lesson, always a high spot in the week. Thursday again, a take-it-easy kinda day , Friday quick whizz round the shops for mum then back home to pack...I am off for a weekend at Witney, Oxfordshire with a load of other melodeonistas for 2 days of workshops! Yay! And guess who is one of the tutors....yessssss! ANDY CUTTING! Phew, calm down Lynne. Anyway, I wil fill you in about that when I get back...blogging will be a little behind I'm afraid. I am thoroughly enjoying my low-key, kicking-back, sybaritic week. A photo of the finished wool/felt cushion, I rather like the little 'tongues' round the edge, don't you? And this is just a glimpse of a felty heart which has been winging its way to a bloggy friend. And this is a glimpse of the dining room table which is going to stay like this for the next couple of days - but I will tidy up before I go, promise! Now though these next photos are not textile related, I want to talk about them for a couple of reasons. The first is that I love graphic prints, and these lino cuts are brilliant. And secondly I love to give a heads up to local Norfolk artists and crafters. I adore the work of Angie Lewin, and pore over her book Plants and Places often; and a book by printmaker Mark Hearld is hopefully going to find its way into my Christmas stocking. 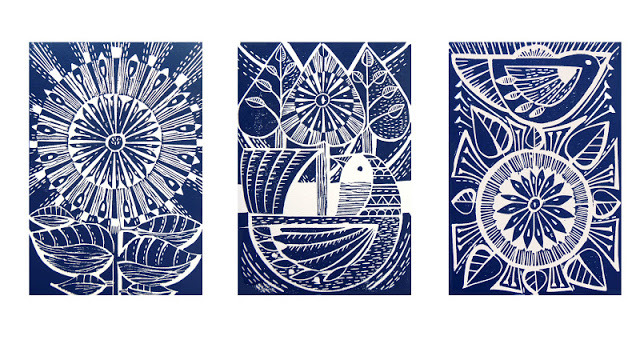 I noticed these lovely lino cuts on Pinterest - sorry I can't remember whose - and clicked on through to read all about Amanda Colville, and immediately remembered reading about her as a winner in Country Living's Kitchen Table Talent Awards 2012 - the September issue. Amanda did a printmaking course at the College of West Anglia and went on to create these fabulous lino prints, using of all things, an old mangle! She has a blog mangleprints.blogspot.co.uk and a website. Her prints are available on-line and at some interesting shops around the UK.....our nearest is at Dalegate Market, Burnham Deepdale on the north Norfolk coast. A really good excuse for a trip out if you ask me! I have contacted Amanda and have her permission to include her photos here. My post-header is of course one of her prints, too. I'd just like to wish her luck in her enterprise and hope she gets lots of lovely orders for Christmas! Well that's it for now folks, just like to say I was a trifle overwhelmed by the response to my '50 shades of gery' hair colour! I hope you will be as fulsome in your praise for Amanda's work. See you after the weekend, I'm now going to settle down to more stitching whilst listening to Michael Jayston reading aloud to me from a PD James thriller - what's not to love? Lovely stuff Lynne! That felt cushion is wonderful so soft and cosy looking. The lino prints are amazing - will be off to check out Amanda's work when I post this. Have a good rest of the day - like you I have the place to myself today and it's bliss isn't it?!! Have a good time at the workshop too. Oh good, I'm so glad you like the lino prints! I will certainly enjoy the workshops, getting quite excited! I discovered Mark Hearld's work recently too, love Angie Lewin and yes, remember Amanda and am off to look at her website now... assuming she has one! I love lino prints, and remember on a recent antique programme someone bought an old mangle to sell at auction and I immediately thought of Amanda and a good use for a mangle. Great cushion.... I DO admire your neat cutting out, so symmetrical, I know when I try it there will be a bit of a wonkiness! Hi MAggie...oh great another reader checking out Amanda's stuff - she's good, isn't she? Now about the felt cut outs...I draw or trace onto freezer paper (or tracing paper) first and iron or pin it to the felt. I am no cut at eyeballing for cutting out! Love the felty cushion Lynne! And the Lino prints are gorgeous too. Hi Jools, nice to see you here! Yes, I remember my mums old mangle - Monday mornings were ripe with her shouting at it when it got stuck - usually on a liberty-bodice button! The only 'naughty' word she ever used was in Monday morning as she wrestled with the mangle 'sod it! sod it' between gritted teeth! Thanks for your interesting and beautiful post, a joy to share. Love the crafts you've made and the glimpse into the joys of your rich life. Hope you have a wonderful workshop in Witney. I'm off to Rochdale for a lino cutting workshop with Doodly Bird Lynn and Carol C.
Hoi Penny! Glad it arrived safely and that you like it...I was a bit apprehensive as it isn't a huge piece of work, but I did enjoy stitching it and sending it too. Please don't be knocking yourself out to return anything, really. I love the Lino prints especially the green and red they look lovely together. Beautiful lino cuts. I remember I had a lino set when I was (much) younger, it was good fun. I know to that lovely feeling of being all snug and cozy indoors when the weather is giving it some outside! It's a good feeling! Ah, Sandra, thank you, it was such a sad and tragic thing to happen, she was almost 68 and always so well but it was one of those evil brain tumours and very fast too.She was the one who got the sewing genes, she was a 'proper' dressmaker. Thanks for the link through to Amanda's blog. I love linocut and her work is astonishing - a real joy to look at. Your own cushion is wonderful too - all those little stiches! Such enormous patience that must require. and I love the colours you've used too. enjoy your weekend - I hope it's as special as you anticipate. ps how was lunch at Jamies? I ate at one of his places recently and it was a bit of a disappointment. 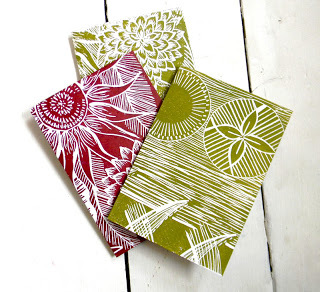 The lino print workshop is on Saturday and yes! it will be posted by me and also Lynn Doodly Bird. The brayer workshop last week was with Vicky Stampers Monthly Group. The brayer is a rubber roller that applies colour (we used Adirondack ink pads) in various ways. Brayering over a punched paper disc give a moon effect, over torn paper produces the effect of mountain contours. Shaded ink pads can be used (Kaleidoscope pads) etc. How did I miss the news about your sister? So sad for you especially losing her at such an early age. My heartfelt sympathies go to you. AH thanks, Jo, that's cleared that little mystery up for me. I have a brayer, just couldn't work out how you'd done the cards. As to the news about Diana, well, it happened last autumn and I've never mentioned it on my blog because....well, it predates my blog and it's not the sort of thing you can throw into a conversation really, just that I had answered something on Sandra's blog and she mantioned it here. Thank you for your very kind thoughts. Andy Cutting (and lino prints, in a single post) ... be still my beating heart! Would I fit in your suitcase for the weekend do you think? You're a clearly a whizz with the felt ... much cushion love from me! Triette ... awesome ... 'real' music, if you know what I mean, though I have to admit the album just got knocked off the top of the playlist here by the Lumineers. And (gosh, this is turning into the longest comment ever) ... you look fabulous in that hat! Hi Cathy, yes it was great - see my reply above. I'd LOVE to do a short course, jsy to be able to make some cards.......hmmmmmm you see...I'm off prevaricating again! Hi Lynne, I love the way a textile artist thinks, and your enthusiasm about your weekend workshop is so exciting that I can feel it all the way here in the USA. I know that you are going to have a ball and that anyone that is around you, will be having fun, too. Your excitement is contagious :) . . . Oh, and that pillow cushion is beautiful!!! You are so talented. Thank you for the lovely comment about my journal art. I love how we all share ideas and how we take bits and pieces from things we see and make them our own. Sometimes it's the colors, somethings it's the texture, sometimes it's a transformed object . . . an artist's mind never rests . . . and you never know what might spark an idea. I have had more communication with other artists, in the last year, since I've been blogging than I have had in my whole life. I love it, and I love seeing how everyone interpreters, rearranges, and maneuvers ideas around, to come up with fresh and wonderfully artful surprises. Life is like a box of crayons . . .
Hope your workshop was great. We are busy working on our folk festival programme.